2019 update click to The Bug Out Bag Evacuate Page for updates to the below list but please read this whole post first too! For those of you who haven't heard of a Bug-out bag, it is a carry bag, backpack or in a dog's case, saddlebag that you pack with emergency survival gear to last a certain amount of time, 24 hours, 48 hours, 72 hours. 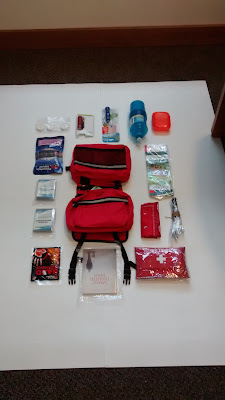 It's also called a go-bag, ready pack, grab-bag or 72 hour pack and it is meant to hold what you need to survive in the event of a disaster or emergency. When you go away from home and leave food plus necessities behind this bag holds what you and your dog need to survive no matter where you are or what happens. To be ready for emergencies every household should have a 72 hour Bug-out bag for each person and pet packed ready at all times. This bag is meant to be a grab and go-to for food, water and first aid. You either carry it to a safe place when evacuating or have the bag with you when needed if something happens no matter where you are. The basic needs to survive are food, water and first aid but other items can make the journey or stay away from home much more enjoyable or productive and safe. Like packing a simple fish hook and line in the bag because that small item can feed you for days after an earthquake or hurricane and long after the food in the Bug-out bag runs out. While doing search and rescue work we were required to carry at all times a 72 hour backpack or pack no matter what we were engaged in or how many other people were with us, we each had to be able to take care of and provide for ourselves. In an actually disaster or emergency, you will have to take care of your needs too. Each person will have to take care of themselves for a little while until help arrives. This can be minutes or days depending on the situation and location. This go-bag or bug-out list is made up from items I actually used during search incidents and also includes what is recommended by FEMA and other agencies. Each person and pet should have a bag of it's own. 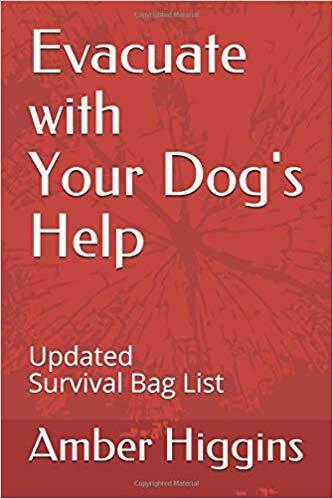 One of the first things I realized when I started writing the family disaster dog lessons was that most dogs could carry some of our survival gear or extra first aid supplies or food along with their own pet supplies. Then I wondered why didn't somebody else think of this :) Why didn't my Bloodhound carry my 72 hour bag way back then, oh the backache I could of saved myself today. I actually fitted Daisy and Willie up with bags as we wrote the first article and they both loved being so much help, they were excited and wanted to wear the bags everywhere. 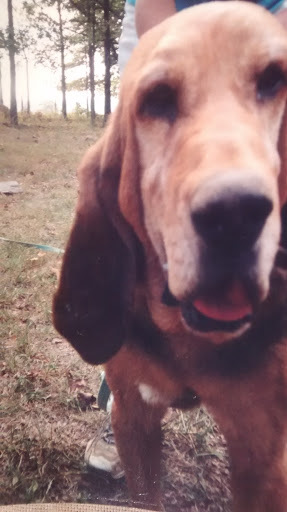 Daisy pictured below was a big girl, she even had a frying pan hanging on her pack for us to cook supper with. She was 12 years old and Willie was older when he started bug-out bagging, we had fun with it. 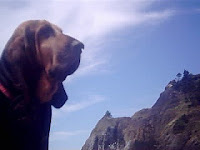 When I looked online, I found out that all of the dog or pet bug-out bags (emergency survival bag) recommendations or lists follow a general rule of suggestions that usually contain only basic pet items. 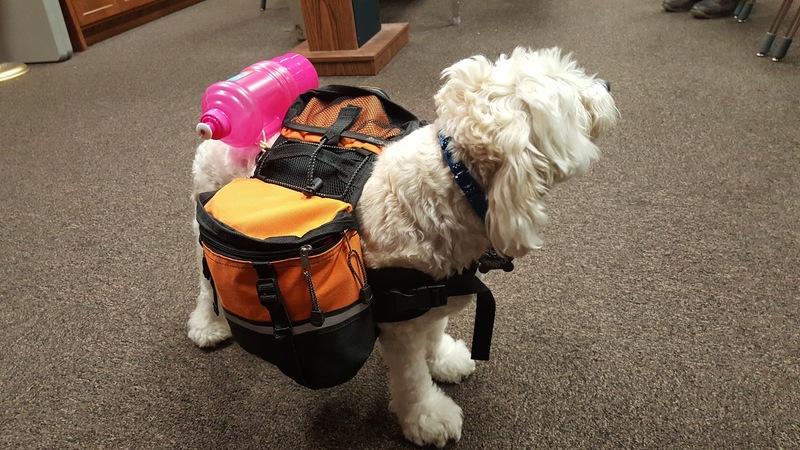 Not many people had thought of including the dog owner's emergency preparedness items in a dog saddlebag, along with the dog's food for disaster or evacuation purposes. I do sell packed Family Disaster Dog Bags at events I do...here is "Dumpster" dog getting one.. I thought this was a great idea because the dog can be included in being prepared for an emergency and instead of us trying to save the dog during a flood or tornado, the dog is helping us save the family or ourselves. Teach just one of my training lessons to any dog and you may save a life. The dog doesn't need to learn all the lessons. Like people every dog is different and has abilities they can use to help themselves and others in some way. This concept of having the dog rescue us puts the dog into disaster planning where the dog will not end up lost, left behind or in a shelter. The dog has a purpose to stay with the family and help too. 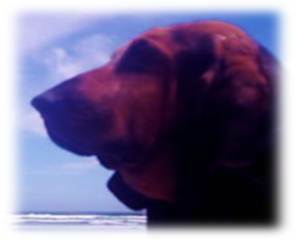 Why not use the dog's natural age old assistance they are always willing and ready to give us? Everyone I talk to agrees that the dog carrying the bag is a great helpful idea. Our dogs are proud to carry extra things we might need and this gives the dog a job so they know what to do too, instead of being scared and in distress of the unexpected. You can teach your dog to get the saddlebags and bring them to you too which saves valuable time as you get other people and things ready to evacuate. I have the lesson in the Family Disaster Dogs book and up on the lesson page above in the menu bar, you'll find the link. Also, I have a lesson that teaches how your dog can wake you and family members in an emergency, like when tornado or storm sirens go off. You can send the dog to wake the children while you get the car ready. A well planned family could have a dog that helped load the car by waking up the children and fetching the gear to the car then all you do is open the doors. The dog carrying a backpack can save valuable time and energy, this could be especially helpful for families with young children who can't carry much weight over long foot travel or an elderly person who can't carry much. You or other people would have to carry twice the load in that case, if there isn't a dog to help with the load. I think it’s a good idea to evaluate the list below based on your own experience, location and then add items to it that might be useful for you and your family's environment. The list below looks large but it is meant to be lightweight and take up less space so you and your dog can carry food, water and a change of clothes in your backpacks. You may have to travel several miles on foot and the weight of a backpack can become a critical aspect when you have a long way to walk. The 72 hour Go-Bag or Ready Bag that is recommended by FEMA and emergency management directors worldwide is designed for you to carry so you can walk to a safe location and survive for 3 days. Unless you have a very small dog or pet, such as a bird, don’t worry about having a dog crate/cage to evacuate with unless you want to drag it along with you as you walk or if you are going to a human shelter which requires dog crates. A crate is important once you get to your bug out place or safe house. It is a good idea to have a crate waiting for you at your evacuation destination. A leash is more important to have with your dog along with basic obedience training, in case a leash is not available. A pillow case is handy to hold cats or other small mammals during extremely frightening times because the animal cannot see what is going on, they can breath and the material is comforting like a nest. Birds can be slipped into a sock with the head out of a hole or gently covered so they do not see and get upset. Most animals can become very scared when people get excited or traumatized. It is safer to crate them or put them in a quite area away from the excitement, if at all possible. If left on their own, most animals will seek shelter and come out after the excitement calms down and they will stay close to home unless they are scared away, and then most will return to a familiar location in a day or two. Inform animal rescue workers of your pets’ status by Writing On your front door or in a highly visible window, use chalk, paint or marker to write the number and types of pets in your residence. Include their location in your home and the date that you evacuated. Do not tie or cage up your pet in your home. If the house floods or collapses with windows breaking, the pet can escape if not confined in a cage or tied. If you have any ideas you would like to share with others, please use the contact page to leave me a comment or idea to include on this site or share with others. These items are the survival supplies recommended for you to carry in bug-out bags. Pet carrier or crate for each pet labeled with pet and owner’s information (keep near your bag). Be aware that some shelters will only allow service animals. In a large-scale disaster, animal shelters will be set up when possible. Many of these facilities will be closed to the public in order to be able to deal with the rescues going in through other channels. The case load will be to large to take care of everyone which is why people should learn all they can about surviving without help. 1. Name, address and phone number of veterinarian, animal control and shelters in the area. This is a good idea if you are in a situation away from home so your animal can be taken care of. 3. Be sure you leave a note with a friend about your pet being left at a kennel or day care in case something happens to you so they can get your pet. Kennels or day care facilities are often left with abandon dogs whose owners have disappeared. If you are in a disaster, unless you have direct contact to a person, do not count on anybody to be able to help you because they might be in the same situation and need help themselves. A Scent Article from each family member packed individually and secured in a plastic bag. 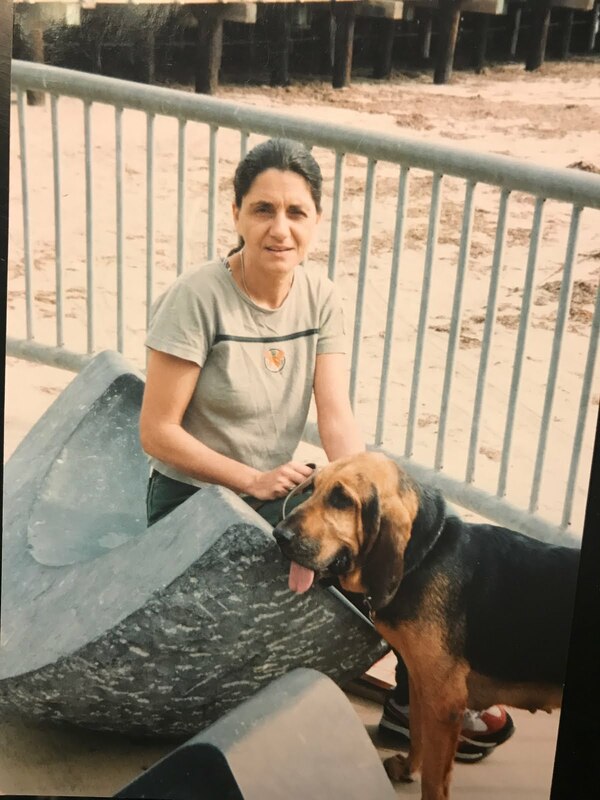 Even if your dog is not trained they can be given a scent and they will seek the scent if you pay close attention you can read the dog, for instance, the nose may point in the person's direction while the dog remains sitting. Candles and matches in a waterproof baggie. 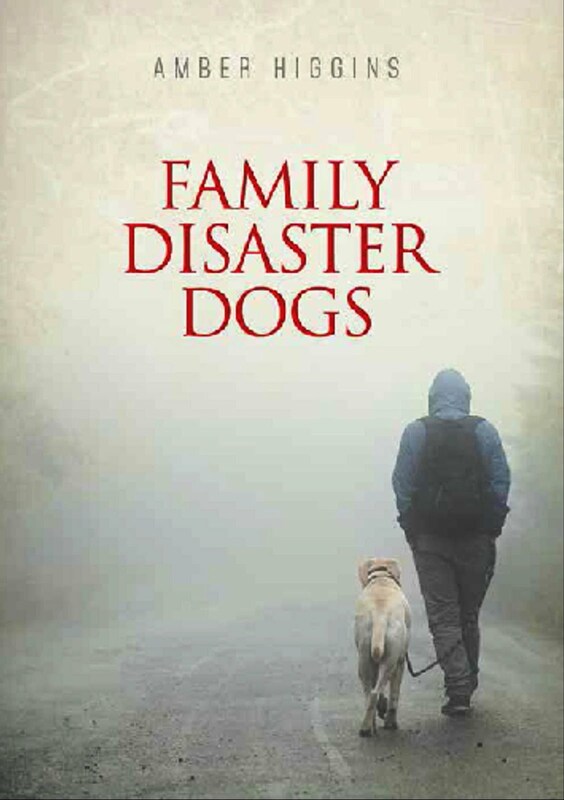 A book to read, like the family disaster dog book which is made to fit in a Bug-out bag. I have paperback copies for sale ($9.99 paypal) via contact page above in menu. Get the Ebook by clicking image below for your device to read as you bug-out. Nutri-Cal is Concentrated Dog Food source used for sick animals that cannot eat. 1 teaspoon per 10 lbs body weight will keep your dog alive after you run out of dog food. This is a good standby to have. 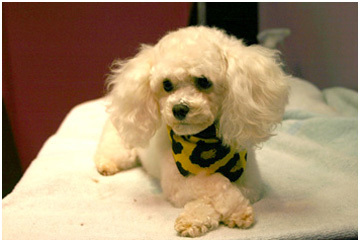 Bandanna or scarf for muzzling, bandaging or using to hold your dog if you lose your other equipment. This should be hung on your dog’s pack as a flag for visibility by you at night. A bandanna is one of my favorite pieces of equipment because of their many uses. Plastic baggies to waterproof everything in the backpack. All of these items can be rolled or folded small to fit. A couple of large garbage bags have many uses, as a tent, a rain coat, a sleeping bag or to carry items you find to eat. A small waterproof container that can hold 10 Q-tips, a few cotton balls, matches, a foot or two of small twine, a razor blade, needle and thread. Your dog should carry a couple days of food and water for you also, along with a small first aid kit in addition to what you carry in your own bug-out bag survival backpack in case one bag is lost. There are many great brands of lightweight dehydrated human and pet food in the hunting section of large retailers, like Walmart or Amazon. Extra light weight clothing can be hung over the dog's backpack in a plastic garbage bag to stay clean and dry. Thanks for reading and I hope none of you ever have to Bug-out! Now available from Waldorf Publishing my children's book that shows your child how to ask your dog for help to find you and what a child can do when they find themselves lost ! 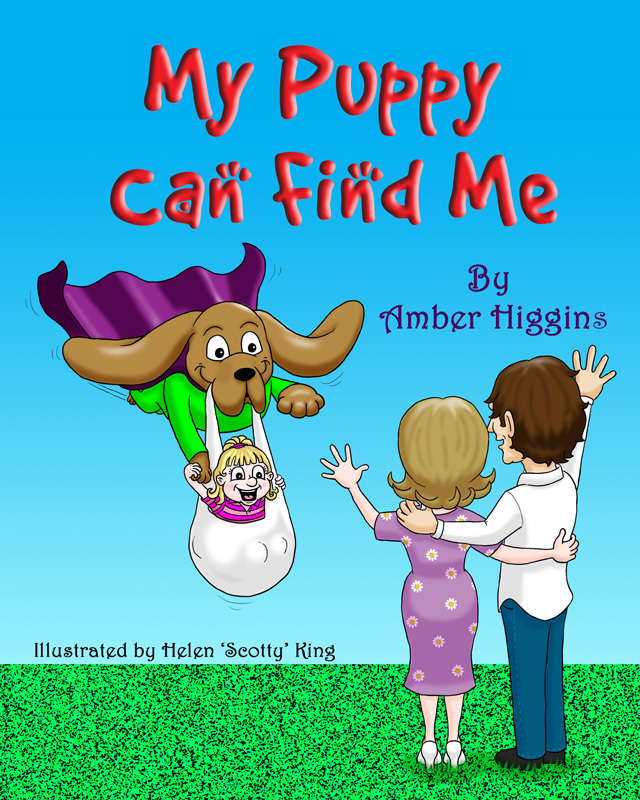 Click to see "My Puppy Can Find Me" by Amber Higgins. I have a great illustrator in the UK who did the cartoons too! Sign up for the newsletter at the links on the sidebar to the right. BE CALM & CARRY ON !